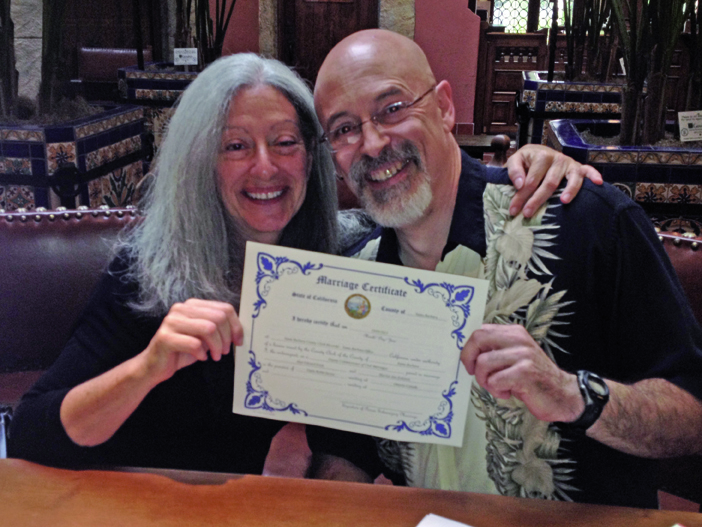 On October 3, 2013 Harriet Eckstein and Alan Irwin officially got married. We’ve been in a relationship for 28 years, but this year DOMA, the federal Defense of Marriage Act, and Prop 8, the California marriage discrimination law, were both thrown out as the obviously discriminatory legislation that they were. So that led us to the Santa Barbara Courthouse at 4:00 pm on October 3. Gayle, Harriet’s recently discovered sister (a long and wonderful story for another time) was in town visiting and served as our witness. No one else knew in advance, and so no one else could endow the marriage with more ceremony than we wanted. Half an hour later (and after leaving the county clerks laughing from our “performance”) we were married. It cost us $237 (Harriet was outraged). I wanted a simple Facebook status change to be my announcement, but Facebook makes a “marriage” status change into some huge announcement, so I scrambled to get some sort of picture posted with it. Harriet put together an official announcement which I’ve posted, below (click on the Announcement). We appreciate everyone’s congratulations. I understand the motivation and desire to somehow express approval and appreciation of the relationship that Harriet and I have. And I want to make it clear that we are in a committed relationship to each other, it’s just that we’ve been in that committed relationship for 28 years. The marriage licences has in no way changed our commitment, our relationship, and our intents. It has just changed certain aspects of our legal and financial situation. Those aren’t insignificant, it’s just not the typical aspects of marriage that are assumed in social discussions (“hey, congratulations on taking advantage of tax laws covering inheritance of real property you crazy kids”). If you ever come up San Francisco it would great to see you two.